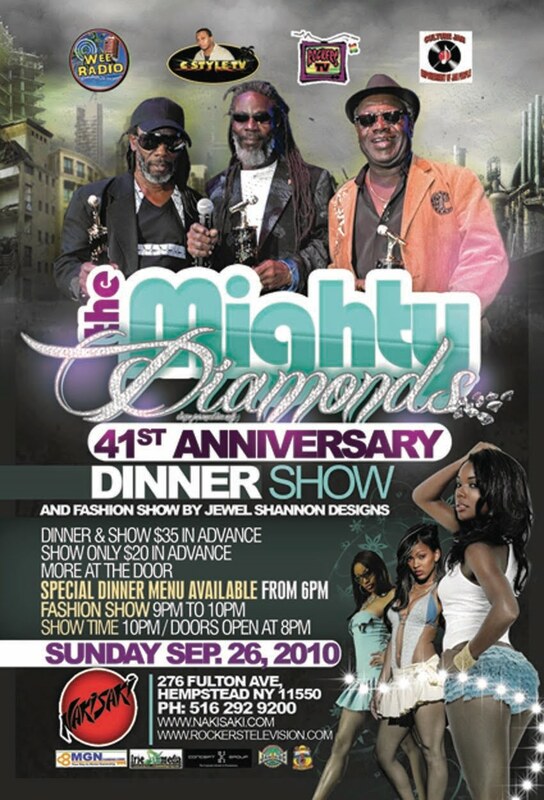 On Sunday September 26, 2010 Nakisaki Restaurant and Night Club will be hosting "The Mighty Diamonds " 41st Anniversary Dinner Show and Fashion Show. Dinner is from 6pm,Fashion Show starts at 9pm , showtime is 10pm. Club is opened at 8pm. Limited seating for this very special event. Be a part of this historical event as The Mighty Diamonds will be Awarded with Citations from "The Nassau County" for their outstanding careers in the field of music. Presenting the Awards will be Mr. Raymond Thomas from The Nassau County Department of Community Development and Mr. Herb Flores from The Nassau County Department for Minority Affairs. 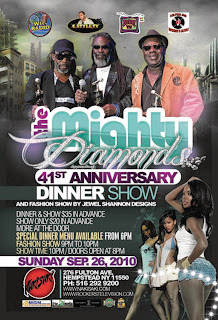 Downloads are currently available by the Might Diamonds: Best of Mighty Diamonds , Right Time , and Deeper Roots and Dub .